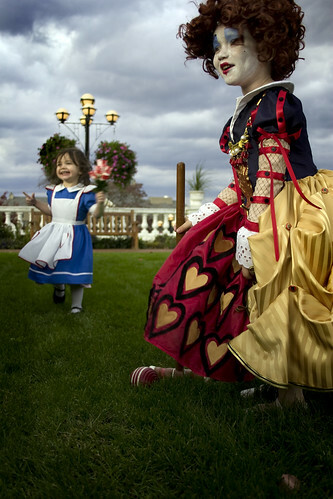 Queen of Hearts and Alice in Wonderland Costume Set GIVEAWAY!!!! CLOSED. When July came around I began debating what I would make for Halloween. 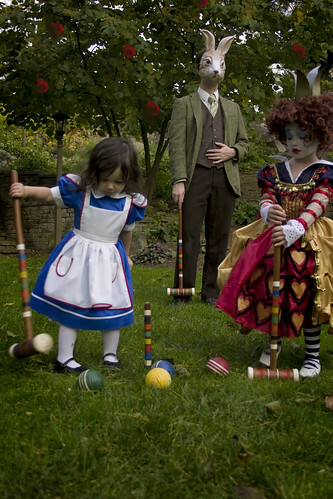 Then I came across Tim Burton's 'Alice in Wonderland' stills and I knew I had found my muse. 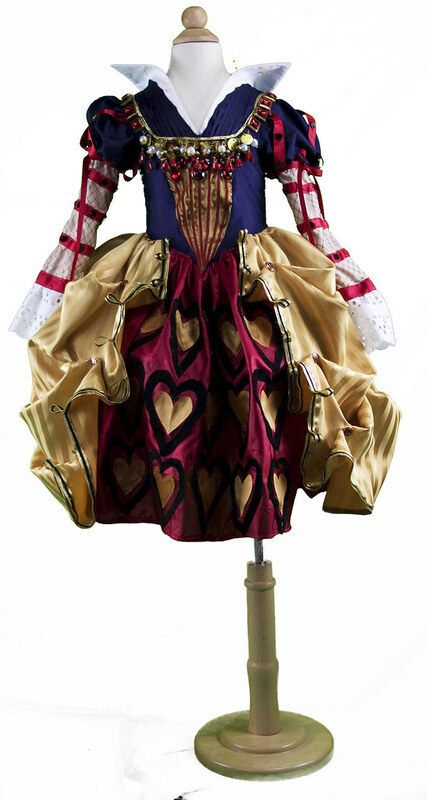 The Queen of Hearts dress is modeled after his version here, and here. 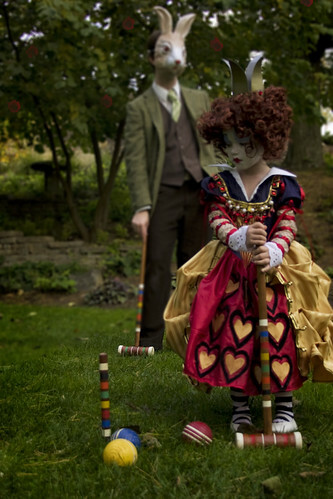 The giveaway includes: The Queen of Hearts Dress, wig and crown and striped tights and red pettiskirt. The Alice in Wonderland Dress. The rabbit mask. TO BE ENTERED PLEASE LINK TO THIS POST. EITHER USE THE LINK AT THE BOTTOM OF THIS POST OR CREATE YOUR OWN. For the Queen of Hearts dress, I tried to exact every small detail. (Notice the pintucked upper bodice:) Of course, there were a number of things I could not find. The gold and red paisley overskirt material wasn't available at any store I visited. So I bought the gold striped material instead and bustled it with black and red striped gold buttons. Bustles just look better anyway. Lily was surprisingly cooperative about all the makeup. I think she has this little girl obsession with it. Plus when I told her that I was going to make a heart shape on her lips she became excited and ran to the mirror before I could even finish. If you want to know how I made Lily's makeup, here is a REALLY perfect tutorial. Kandee, a makeup artist in LA explains how to make various costume makeup tutorials as well as basic everyday makeup tutorials. Very handy. 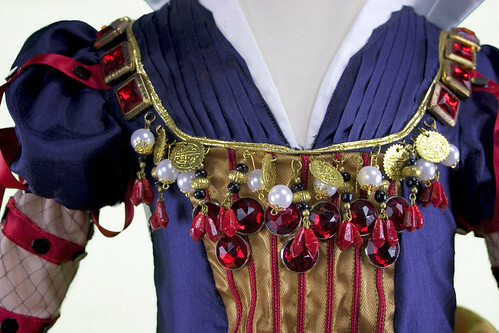 The jewelry detailing on the upper bodice was all done by hand. I mean with pliers and metal cutters. I can't tell you how many details went into this dress. There might just be a hundred buttons. And did I mention I didn't use a single pattern. It literally took weeks to finish. Of course I didn't work on it everyday but from the first day I started to the last day (being today) weeks have passed. Seeing it on the mannequin was so rewarding. And making the patterns was so much easier with it. I didn't have to ask Lily to take her shirt off once. 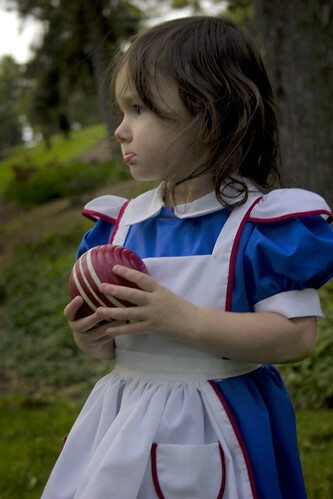 Molly's little Alice costume was a little easier to make:) But simply ADORABLE none-the-less. I did use a pattern for the upper bodice. But the sleeves, skirt collar and apron sleeves are my own. I brought a black ribbon to go in her hair but forgot to bring a scissors to cut it. So that was a bust. We brought so many props that just never got used and it was such a shame. Brian had a black umbrella. Lily had a scepter. I brought a red paint can and painted brush for Molly. The croquet set I brought down from my mother's attic. That alone should be worth something because it was in the back where the light doesn't shine and nothing has been touched for decades. Her house is literally crawling with centipedes so I didn't even want to know what was waiting to crawl onto my hands when I put my fingers around the top. Once I got it down the stairs and into the light, things didn't look half bad. We've had it since I was born, probably longer, so it's from the 70s. While I wiped it down my mother told me a sad story about how she always hoped to use it for parties. I'm glad we took a lot of pictures of Lily and Molly in these dresses because it will break my heart to give them away. I'm hoping the winner will be able to put them to good use. Molly was so difficult to shoot. We went after I picked Lily up from Kindergarten so by the time I got her makeup on and the car packed the sunlight was quickly fading so I had to set my shutter speed low. In retrospect I should have used a different lens with a wider aperture or bumped my ISO to 400 but in the heat of the moment everything flies out the window. Photographing children is SOO HARD! Molly does not sit still. Not if you beg, plead or bargain with her. She runs around and screams and looks like a blur on the lens. What I really like about the queen's dress is that you can wear a long sleeves v-neck shirt underneath and pants. So on cold Trick or Treat nights you don't have to worry about compromising the look of the costume. In case you missed it, a red pettiskirt is also included. This can be worn underneath the queen of hearts skirt to puff it out but it can ALSO be worn by itself as a pettiskirt. It's the same one featured here. Lily was excited to submit one of these photos for the Sprouterrific Halloween Costume Contest. I think it was partially responsible for her motivation to do the photos. Not five minutes after I sat down to my computer to upload the photos from the camera did she ask if I sent a photo yet. Here's hoping she wins something:) I forgot to send a homemade card on her birthday so I need to do some make up work. Oh, I didn't really say too much about Molly's costume. 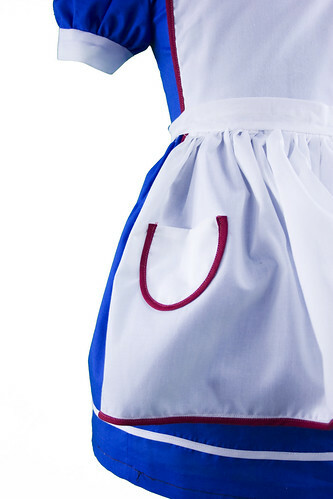 Well, I added little rounded pockets on the apron. The first time we put the finished costume on her was at the shooting location. Our initial reactions were 'awwww'. If I had the extra time I would have made a pettiskirt for underneath her skirt as well. If you win and have an extra one I would recommend using it. I think it would add that extra pinch of cuteness. Since the Queen of hearts is known for her short temper, I would have also made a card costume for myself so that Lily would have someone to abuse in the photos, if I would have had enough time. As it turned out Brian had to be that willing participant. But as you can see, it was Lily's favorite part of the shoot. 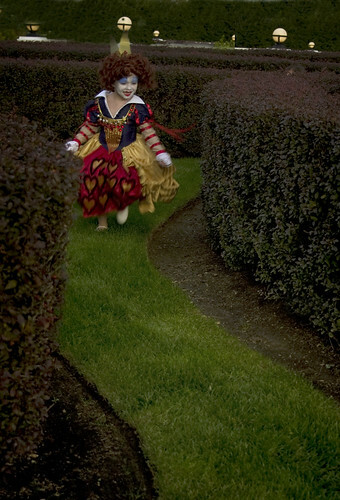 Both Lily and Molly enjoyed chasing him through the hedge maze and around the amphitheater. We were really lucky to score a semi decent day this late in October. It was still warm enough to wear short sleeves. The sun came out once or twice and most importantly, IT DID NOT RAIN. It is supposed to rain through the rest of the week so I knew if I was going to post these pics it would have to be soon! I'm trying to think of new set designs for my indoor (makeshift) studio. Not only is it warmer but it's a lot easier to control the babies downstairs. This will probably be one of my last outdoor photo shoots until April. One of the things I hate about living on the east coast is the weather. Give me a hot and humid over frozen and blustery any day, though neither really appeal to me. Days like today, when the temperatures are in the 60s to 70s are just what I love. My mother was born and raised in Hawaii then moved to California after she was married. Why they moved to Pennsylvania I'll never know. I once read a strange statistic about Pacific Islanders that said something like only 1-2% of native born Pacific Islanders move to the East Coast. Really? Maybe I somehow read that wrong? Another prop I wish I could have found were flamingos. But how many times do you see stuffed flamingos? I used to work at Hersheypark as a teenager. I once worked at this game called 'Rising Waters'. Whenever people played it sang the main reframe of Kenny Loggins' "I'm Alright". After 100 games it was enough to drive you to tears. But the prize for winning? A FLAMINGO! I bet they still have them there now. I kind of thought Lily's hair looked like it would also work for an 'Annie' costume. Speaking of Annie, Molly at only 2, has a concerning obsession for the movie and requests to watch it everyday. She is absolutely terrified of the telephone. When Brian calls I ask if she wants to talk and she immediately collapses on the floor in tears. I asked her if she wanted to call daddy, she shook her head no. Grandma? No. Grandpa? No. Lily? Pause, no. Annie? Yes. Annie, are you sure? YES! She's obsessed I tell you! Wow. This post is taking a long time to write! So many photos! It is like three costumes in one post. It's now 1:40 in the morning and I have the season finale of 'Drop Dead Diva' playing in the background. It's a little scary how much 'Lifetime' I've found myself watching recently. I used to make fun of my mother for watching too much Lifetime. What does that say about me? A good Jim Gaffigan joke: "My favorite channel is the Lifetime Channel because Lifetime is television for women -- Lifetime: Television for Women. Yet, for some reason, there's always a woman getting beaten on that channel." The majority of these costumes I made while watching the Project Runway 24 hour marathon (also on Lifetime) which is exactly what one should watch when taking one a big sewing project. It makes you feel all creative and professional. So there it is, I hope you liked this set. And please, check back soon for more Grosgrain Halloween goodness! There's still more to come! I plan on entering Shabby Apple's Dare to Design contest and I have my dress all planned out in my head and ready to go. Now, to find the time to make it by November. I would say that the Queen of Hearts dress would fit a 3T-5T. Maybe 6T? Depending on how big your child is. 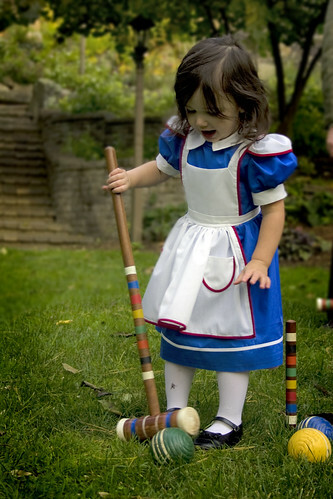 The Alice in Wonderland costume would fit an 18month-2T. The rabbit mask would fit an adult. ALTHOUGH, when I bought it online it said it was for a child. So probably both? THE WINNER OF THIS GIVEAWAY WILL BE ANNOUNCED ON OCTOBER 25TH SO THAT THE COSTUME CAN BE MAILED OUT BY TRICK OR TREAT NIGHT. If you'd like to win one of this costume set just link to this post either using the 'create a link' at the bottom of this post or simply creating a post on your blog and including this link. Wow - that is your best creation yet. This is truly amazing. These are just amazing! Both of my girls are crazy in love with Alice in Wonderland and would LOVE these. I'm just BLOWN AWAY! Absolutely beautiful!!! I really, really, really, really, REALLY hope I WIN!! Crossing all of my fingers and toes for this one! AMAZING! I'm wowed. I'm bowled over. I'm wishing I had your talent. Haha. Or your costume for my little girl. Thanks for sharing this! the dresses are so wonderfull!!!!! That is absolutely stunning!!! I'm just floored by the detail. I have totally linked to this! Wow. those are simply STUNNING! I Love them!!! This is AMAZING! You are one talented lady. Love it. Those costumes are great Kathleen! And the little girls look beautiful. It's really wonderfull ! The link is already on my blog !! Absolutely Amazing! I cannot believe how much detail is in the queen's costume. My two girls would be adorable in these. I have posted a link on my blog. This is so amazing. One of your best (I was also in love with the Marie Antoinette gown) I am so hoping to win this. I have 2 little girls and one is named Lily! I would be such a hero if this showed up. Thank you for sharing your amazing talent with the world. I can't believe the detail in this. Its incredible. I've posted a link and am in complete awe of your creativeness. I am in awe!! I have two little girls - 19 monts and 4 years who would love these. I don't have a blog but I will start one just so that I can enter this giveaway! thanks! I added to my BLOG and on FB! Those are amazing costumes and photos. You are very talented. It think the Queen is the best yet. My daughter would love to win. Each and every day I am blown away with people's creative talent... there is nothing in this world I love to do more than to look at people's clever works of art... I posted to my blog and added to FB! Oh, these are fabulous!!!! When I was in 5th grade I was in an Alice in Wonderland play. 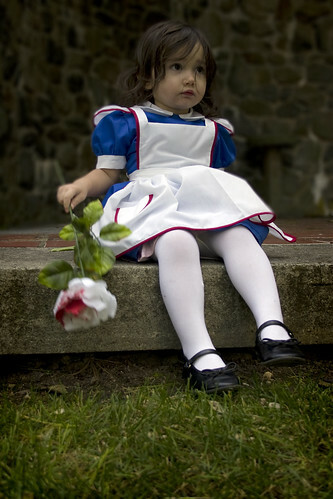 I wanted to play Alice...of course....but the part was split up between my younger sister and my best friend,LOL!!! I played Rose, and I still remember some of my lines, "Flowers, Flowers, hurry to your places. Flowers roll call." LOL!!! I'm turning 40 in December, but for some reason those lines are never going to be forgotten. 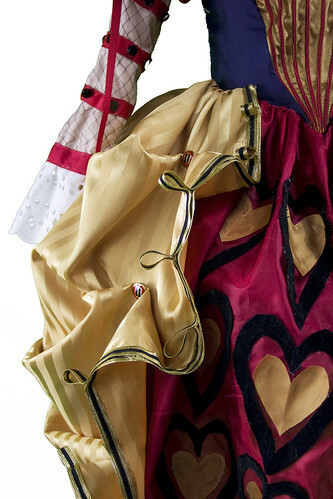 Anyway, wish we had you doing the Queen of Hearts and Alice's costumes back then!!! They are awesome!! 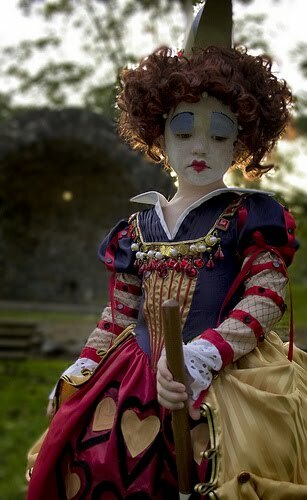 Those costumes are adorable - I love them both - but the Queen of Hearts is a true masterpiece!!! WOW!!! These are beyond awesome! You are so talented both as a designer and a photographer--wow. Thanks for sharing. p.s. Kandee's makeup tutorials really are great!! These costumes are incredible. I can't believe you're giving them away!! I wouldn't be able to do it. They're beautiful! I.Am.Amazed. What a talent! I have a 6 year old and a 3 year old that they would be perfect for!!! I'm crossing all my fingers and hoping to win! I'm in love with this set. Like, literally sitting here drooling over it. 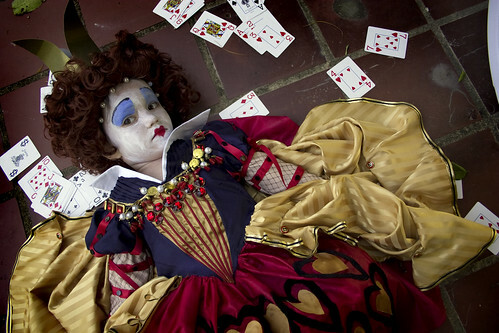 My Boug had already planned on being the Queen of Hearts, but this would send her through the roof with excitement... I'm keeping my fingers crossed, toes crossed, legs crossed, eyes crossed and anything else crossable to win this!! I want the Alice in Wonderland costume SO BAD... me and my husband are being Tweedle Dee and Tweedle Dum and my little 1 yr old would fit PERFECTLY into that Alice Costume! I totally created a link! They are so amazing. I only wish that I could sew like that. Instead I will just hope to win those costumes. I can't even believe you are giving those away! JUST BEAUTIFUL!! 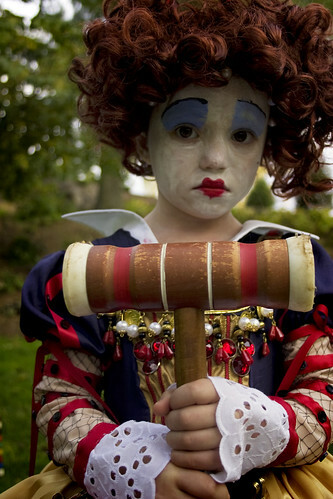 Of course, I HAVE to enter now, since I know the Queen of Hearts would fit my 4 year old, and I think I might be able to squeeze my 2.5 year old into the Alice costume. Now...if I could get my husband to wear the mask...It would be only the second time in my 10 years knowing him that he wore anything resembling a costume. That would be HUGE. Oh yeah, I need to win it first!!! Fingers double, triple, quadruple crossed on this one!! Those are amazing..so beautiful. I could see my girl and her friend dressed up in these costumes! So cute. Love it. Wow.... I don't even know what to say about how AMAZING those dresses are! I need to channel some of your talent when I make my girls halloween costumes this year, lol. Holy Shmoly! These are not dressing up costumes - these are ART! I created a link to my blog, but it is private. I hope that still works. We just did a Queen of Hearts dinner, I wish I had these beautiful dresses for that! They are incredible. You are so talented! I can't even imagine how exciting it would be to win! My daughter and my neice would look so cute in these trick-or-treating together! Amazing. OMG! You out-did yourself this time!!! Linky Love coming your way! AH-mazing work. I wish I had 2 little girls so I could enter, but I won't be selfish and do so just because I want to frame them :) Good luck to whoever wins, this is an amazing giveaway! These are so beautiful I am hoping for a WIN!! My daughters are the perfect ages for this. Wow! These are amazing! I linked to it right away! Awesome costume! It's like a work of art! I would love to see my almost 3 yr old wear this for next years theme. That movie coming out with Johnny Depp will be making this costume very popular. I am Amazed at this lovely give-a-way. I can just see my daughter and her friends having a ball in these costumes! I do hope I win. This costume is AMAZING!!! I love it almost as much as the Marie Therese one. I posted a link to it on my blog for the contest. Here it is! I am in shock! Seriously you are giving this away! I am amazed by you girl!! I am linked up and crossing my fingers and toes for this one!!! My girls would just love this and they are both the same size as your girls! Wow wow wow! I am a new visitor to your site, and I love it. These little costumes are so fun for Halloween and to wear as dress up. It would be hard to give them away. But it would be so fun to be the one who wins!! I hope I did this link right...here is the link to my blog. Wow, these are amazing costumes. Are you crazy?? If I had the talent and ability to create these beautiful costumes I would never, ever GIVE them away!! Oh my goodness. So gorgeous!! My daughter loves Alice. Would love to have those costumes, but I think my daughter would wear it everyday! This your best creation ever!!!!!!!!!!!!!!!!!!!!!!!!!!!!!!!!! I am crossing everything from my toes to my eyes in hopes that we win! I could never part with this one. I can't believe you're giving these away! They are tooo fabuous!!!! I REALLY hope I win!!!!! i have no words... It's really awesome!!!!!!!!!! Wow! Wow! Wow! I posted about this on my blog. This is so fabulous! OH WOW!!!!!!! This is absolutely amazing!!! I love them both and I've got a link on the blog!!! Beautiful job!! OMG - this costume is to DIE for. Funny - we decided about a week ago that B was going to be Alice and that R is going to be the Mad Hatter, I will be the Queen of Hearts and F, if I can convince him, will be the white rabbit. If I were to win this costume it would save me so much time on making costumes. 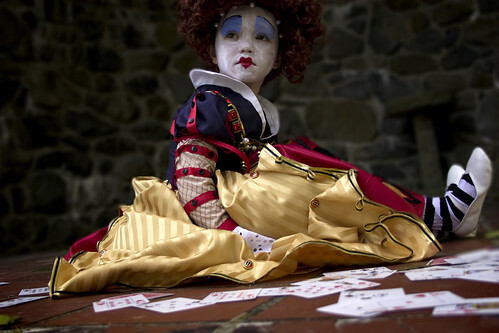 I just love the Queen of Hearts. Amazing! This is so linked to on my blog. Absolutely gorgeous! I linked to my blog. Keeping my fingers crossed. These costumes are works of art. Simply beautiful. Of course I linked this. I have one girl for sure that it would fit and then have several little neices that I could continue to pass it on to. Too bad my oldest is too big for it. I love it, you did a wonderful job. I quilt but can't sew clothes to save my life. I TRULY ENVY YOU! Absolutely gorgeous! I definitely linked my blog! THANK YOU, YOU ARE VERY GENEROUS TO SHARE YOUR TALENT! These are the most beautiful childrens costumes I have ever seen in my life! Whoever wins these will be very VERY Lucky! WOW....simply WOW...these costumes are amazing...I love that the Queen of Hearts was Modelled on Tim Burton's upcoming film...I cannot wait to see it!! I have linked and have my fingers crossed but in any case I have been inspired to do some sewing for Halloween!!! Thanks for the beautiful eye candy!! Totally and completely awe struck! This is amazing. My daughter loves Alice in Wonderland and would be thrilled to have this if she wins! Wow, you are so creative! These are beautiful! Oh! They are absolutely wonderfull! wow! so amazing. nice work. loooove them. I dont have a blog but would love to win this for my little princess. I hope this comment puts me in the running. i have boys...but i still need this. beautiful! I LOVE this! I totally need to win! I don't know if my kids are going to have costumes this year, so I've got my finger crossed! This would be so perfect for my kids. My oldest is 3 and then I have boy/girl twins that are almost 18 months and they could be the rabbit and Alice. You are just amazing! Seriously?!? This is amazing. What gorgeous costumes! You've outdone yourself!! OH. MY. GOODNESS!! You are AMAZING! Just amazing!!! YOu have Totally outdone yourself! Brilliant! I honestly can't believe you plan to give this away...it is just SO beautiful. I now have the most serious creative/craft/seamstress/photo envy. Incredible! Most amazing girls' costume I've ever seen. Your work is stunning and inspiring! I can´t believe it!!!!!!!! It´s so wonderful!!!!!!! I posted you in my giveaways blog. As I sit here in tears trying to sew my own daughters costumes, (I'm not nearly as talented!) I am thinking just how wonderful it would be to win this costume so I could stop crying, I mean sewing. Absolutely amazing! I did post a link on my blog. I keep private blogs but I know some of the ladies who read it will check this out. They really are amazing. I LOVE these!!! You are amazing!! I posted a link from my blog, it is private so I hope that is okay. Are you kidding me??? When are you going to audition for Project Runway? You would totally WIN! Speaking of winning... if I happen to win this giveaway, it will be Christmas in October for my 2 little girls (and me)! I'm keeping my fingers criss-cross-apple-sauced! gorgeous! I created a link. I would love to win this costume. It's gorgeous and would look so great on my daughter Gracie. Thanks! Fantastic!! I've linked to this post on my blog. I am in COMPLETE awe of your talent. What GORGEOUS costumes. Seriously. WOW. I linked - sourfleed.blogspot.com & on my facebook account. I'm gobsmacked. What amazing costumes!!! This may be just about the best thing I have ever seen... I am in love with these costumes. Once again, you have created something that has both left me in awe and inspired me to get out my sewing machine and get going on my own kiddos costumes! I have no idea if I did the link-back correctly, but I definitely have the link on my blog!! Those costumes are spectacular!! Please pick me! I love it! 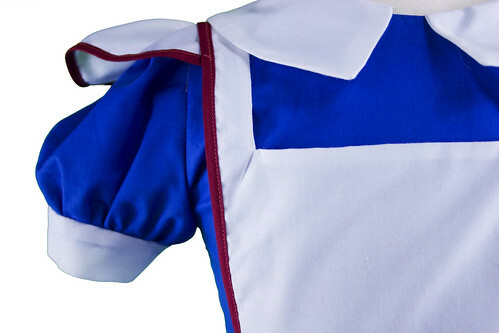 I especially love how clean the Alice dress is, if that makes sense. I never win anything so maybe this will be a first. Fingers crossed! This is A-MAZ-ING!!!! Seriously, I wish that I could be that wonderful and talented. Maybe someday. Beautiful!!!!!!! I would be thrilled to win! Beautifully intricate. I've got it linked up too. AMAZING! I was wondering how you would top last years dress. Last years dress was so gorgeous and this one is incredible for so many reasons! I am making a cartoon version Queen of Hearts for a friends daughter, but now I'm going to have a hard time looking at mine. Wow, can I just come sit in the presence of your great talent? I am linked and hoping to lay my hands on this incredible work of art! These are amazing. I can't believe you are giving them away. They are so wonderful. I love Tim Burton and your designs, what a great combination. Such Joy! I love the queen of hearts dress! Love the pictures and the story that went with it. Just classic. You are so talented!!! Love the dress and it also looks like it was inspired by Snow White's dress as well. Fantastic. So glad I found your site. These are beautiful~You very talented and I am honored to put your link on my blog!! Good Luck To All~This is A Awesome Prize!! OH MY GATSBY!!!!!!!!!!!!! You really aren't human. i know this now. you are a superhuman design CONQUISTADOR! hats off kathleen! you are my favorite designer. officially. Oh good heavens, what an absolutely gorgeous work of art. Oh. My. Gosh! These are breathtaking costumes! My girls would LOVE them! Wow.... just WOW! Absolutely Beautiful...you are very talented! Would love the Queen of Hearts! I cant believe you didnt use a pattern at all! How much fun does your girls get to have! This is the most amazing thing I've ever seen in my life! I think it's funny how most people would dress their kids up in hannah montana costumes or dora the explorer and you created amazing Tim Burton inspired, Original costumes, you are my hero! My daughter is only a year old, and she's going to be an Ewok for halloween, So I figure I won't win the giveaway because you have plenty of deserving people, But I would love to know what pattern you used to create the bodice and anything on how you created the queen of hearts dress! 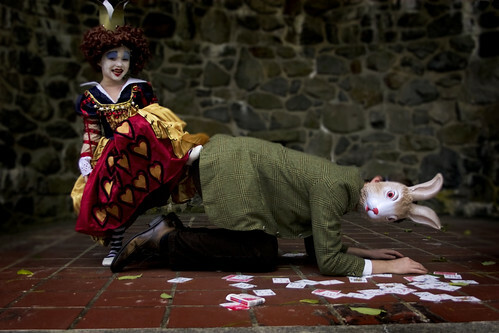 I love the Alice in Wonderland dress, and kudos to your husband for being the rabbit, that is my favorite picture! AMAZING! I'm posted a link from my blog and I'm also posting a link on facebook! It makes me want to sew! I am still new to the blogging world, but i blogged about this amazing giveaway, and then created a seperate "official" link, even though in my blog i also attached a link, but i don't think it attached to your blog, but the second one did...here's wishing good luck for me, I have three girls and two of them would fit these costumes perfectly!! AMAZING costumes. You are very talented, I love them. Wow. You are amazing! I just followed over from A 2 Z and will be adding you to my list. again, I say WOW! WOW, WOW, WOW! You need to be on project runway :) I love this so much and so would my girls! All linked up, thanks! WOWWY ZOwwy!! Posted on blog. Amazing. I love it! posted on my blog! Those are the most absolutely gorgeous dresses I have ever seen. Seriously you are so very talented. I posted your link to my blog and I can't wait to share it with the world. You are amazing! Keep up the good work and creations! GORGEOUS, GORGEOUS Dresses! My little girls would look Divinely, heavenly exstatic in these. Thanks so much for sharing! I forgot to mention how awesome those pictures are. You did a great job, I hope you win your costume contest. Please make sure to announce it on your blog if you do win. Thanks again for sharing! Both the costumes and the photography are wonderful! Wow how ecstatic my girls and I would be to win such an amazing giveaway. oh my gosh, but these are totally amazing! 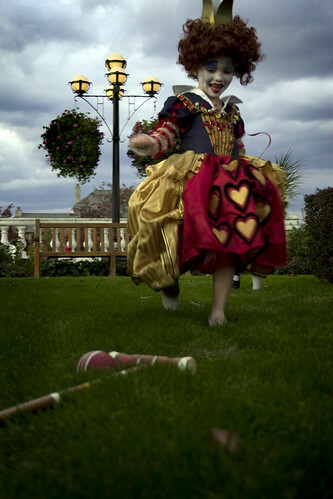 my little girl would be over the moon to have her mommy win that Queen of Hearts outfit for her..we call her our princess, but she'd certainly not mind being the Queen for a day.awesome photos too. have posted a link on my blog. These are beautiful! I know I won't win, but I entered anyway, mainly just to share this post and your blog with my readers (www.deece.net). You are such an awesome seamstress. My little girl LOVES to dress up. This would be great, especially the Snow White. I can't believe you can give this away! Wow, you are an amazing, talented lady! I would love to win this! I'll post a link. Those are gorgeous! What talent. I have four little girls who could easily play either part. And we have the matching child's china set to match that my mother bought when she lived in London. PLEASE! The Home of the BluBabes! Wow, Beautiful Dresses,beautiful models and perfect and beautiful photography!! Oh wow! I am amazed by your creations. The queen of hearts gown is so grand. The work you must have put into it. I think every little girl would love to wear it and complete with make up! :-) Oh and Alice is so adorable :-) I hope all moms out there entering win for their little ones! Only in my dreams do I sew such marvelous creations! Cheers! your best yet I think! I used the create a link to post to my blog and share share share. Stunning costumes! What a great work you did!! What awesome costumes! Amazing! My daughter is going to be alice but Oh how i much rather her get to wear either of these. The detail is great! Just beautiful! I posted a link on my blog : ) My girls would LOVE these. Okay, I posted this to my sad, sad little abused blog. I am hoping and squealing my desires to win out into the universe. These are too fabulous. This is so cute!!!! My daughter loves Alice in Wonderland. You are so stinking amazing!!! What a beautiful give away. Thanks for doing this! I hope this works! Thanks so much for giving us a chance to win this! I really can not believe you made that, you are amazing!!!! I hope against hope I win! This has got to be one of the neatest costume's I have ever seen. Of course I had to share with everyone. Stunning. I DON'T KNOW HOW YOU DO IT. I am not one who wins things, but if I did, I WOULD JUST DIE!!! They would fit my 3 kidos perfectly! I wish I could bribe you. You deserve it! BTW I linked it to my blog. you are seriously amazing. where do you find the time? i love to sew too, you are so inspiring. I wouldn't dare give it away. It is totally fantastic. I added a link to my blog and I hope that is enough to win. AMAZING! This is amazing. My nieces would adore these costumes. AMAZING! I am crossing my fingers! maybe tim burton will give you a job on the next movie! he should be so wise. i hope i win, this piece is like art! I love your website. You are truly crazy-talented on what you can do with fabric. I am an avid follower, as many of my friend are too, in fact, a few of my friends have even sent me your site since I am such an Alice fan, they knew I HAD to enter and see you amazingly beautiful creation. I sure hope I win. You have truly outdone yourself. Oh, and I liked it on my blog. posted on FB...love the costumes...so amazing!! I would love to win this giveaway...we have a costume party every year! by the how can you give then way???? a lot of love went into those beautiful creations! my mom always made our halloween costumes! you are awesome! you have stunning photographs as well! These costumes are just amazing. I made a blog post about the giveaway. Gorgeousness! Very well done. I'm a fairly competent seamstress--which means that given a pattern, I can make pretty much anything and can even alter a pattern.... but I can't design my own. Don't know how, and wouldn't know where to start. Kudos on the beautiful work!